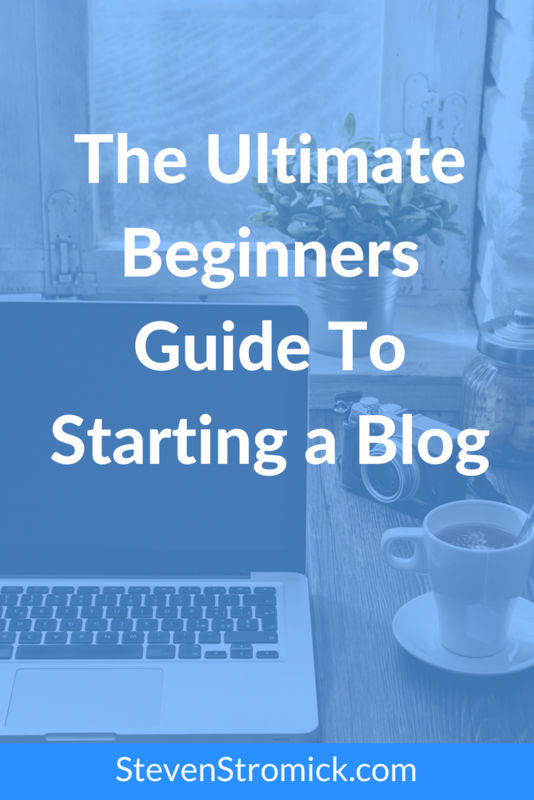 Are you ready to start your blog but not sure what exactly you need to do? In this quick guide, I will take you step-by-step through everything you need to do to get your blog setup, configured and live on the web. With no headaches and just 20 minutes of your time, you can have your new blog up and running! A domain name (aka “URL”) is simply the name for your website on the web. Like http://food.com or http://allrecipes.com, your blog needs its own unique address to identify it. If you don’t have one already, you are going to need to decide on a name (that is not already taken) for your blog. Make is unique and descriptive, your domain name should give someone an idea as to what your blog is about before they even visit it. Avoid hyphens and words that are typically misspelled. If at all possible, get the .com name. When you go to see if your name is available, you will see all sorts of other available extensions (.net, .org, .co, etc.) but the truth is that most people still only think of .com when they enter a domain name. Try to keep your domain name as short as possible – 2-4 words is perfect. Don’t use any words that may be under copyright, for example don’t get FacebookTipsWithSteven.com. Get creative and work in additional words known only to your niche or more common words like “my”, “the”, “a”. If you are still stuck, try using a free service such as namemesh,com. This free services will generate domain name suggestions based on keywords you enter. Choosing a good and reliable hosting company if one of the most important decisions you can make when it comes to your blog. The web hosting company is where all the files related to your website are stored and delivered when someone visits your blog. If you start doing some research on web hosting, you can quickly become confused over the different types of hosting available. A bad web host can cause you unnecessary headaches with common issues such as a slow loading website, an unresponsive website, security issue and an overall bad experience. Do some research and you will see there are hundreds of hosting companies out there all proclaiming to be the best. 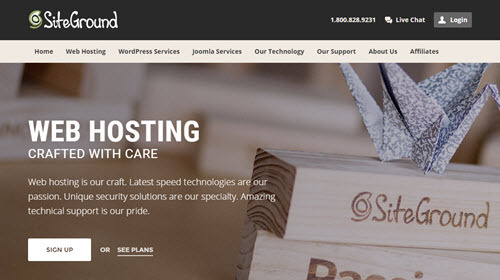 I have build many websites over the past 10+ years and I personally trust and recommend SiteGround because not only do they have reasonable rates but their sites also load lightning fast, they have great customer service and their servers are configured specifically for WordPress. 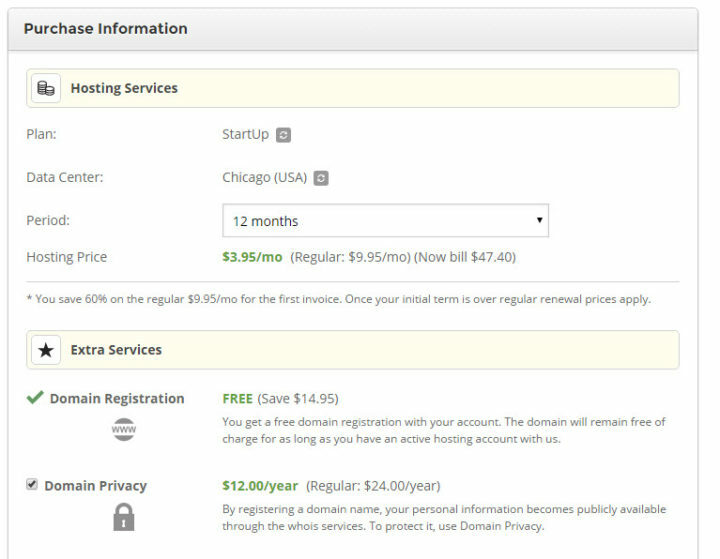 Your domain name is free with hosting, this will save you about $10 per year. Social proof, when it comes to WordPress and blogger’s, this is one of the most popular hosting companies. 30-day money back guarantee means no risk to you! To get started, click here to go to SiteGround and then click “Sign Up.”. The StartUp plan will be just fine since you are just starting out, you can upgrade your plan at anytime in the future as your business grows. If you do already own a domain name (because you’ve purchased it through GoDaddy, or someone else), choose ‘I already have a domain’ and at the end of this tutorial you’ll visit your registrar to point the domain name to siteground’s servers. Next enter your personal details(name, address, etc.) 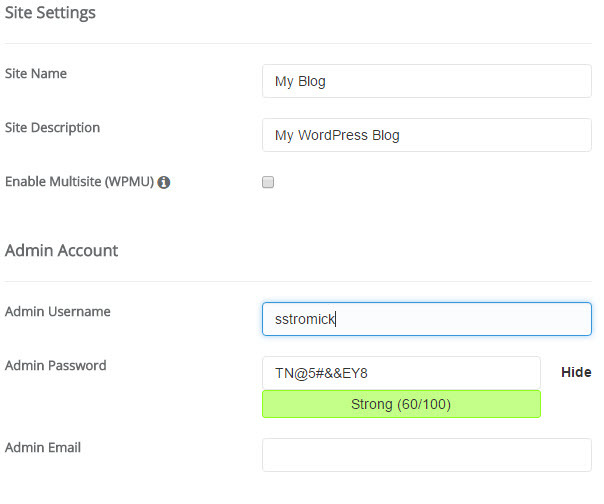 , billing info, and create a password for your account. I recommend you create a strong password as you don’t want any hackers getting into your hosting account. Next, you will chose your billing period. If you pay for the entire year then your domain name is free. 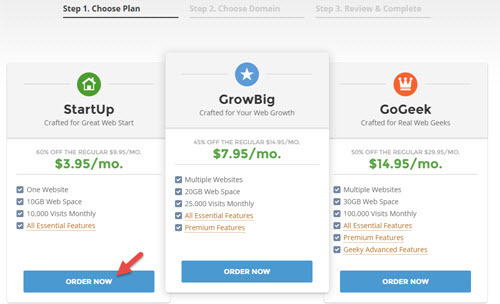 They do offer month-to-month plans but you will need to cover the cost of your domain name. Since they offer a 30-day money back guarantee, I would recommend going with the yearly plan. You can also chose from any additional add-on service packages. I think the only one you may want to consider is the domain privacy. This will hide your personal contact information as the owner of the domain. Finally, make sure you click the checkbox and agree to the terms of service and click the Pay Now button. Congrats! 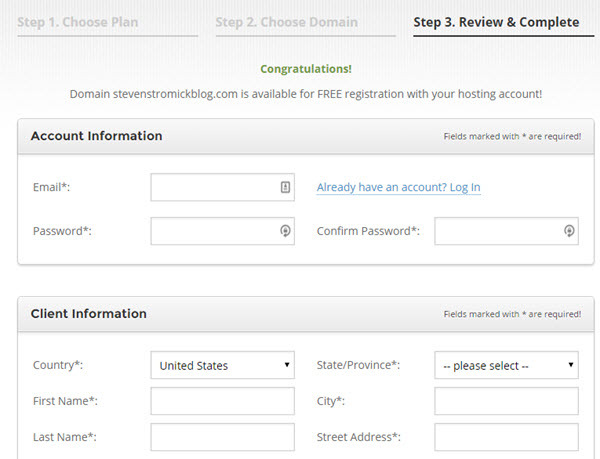 You now have hosting for your blog. 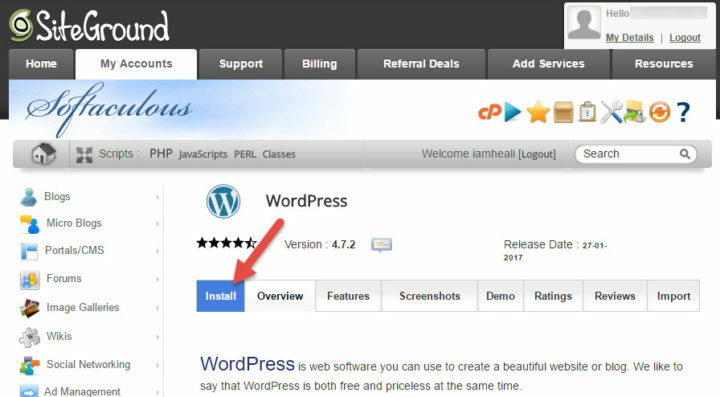 Next all you need to do is to install WordPress. 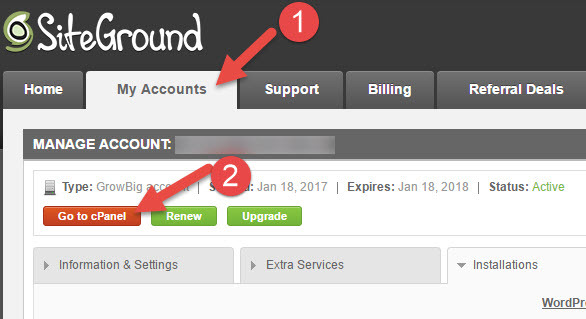 From your Siteground account, go to the ‘My Accounts’ tab and then click on ‘Go To cPanel’. Next, click on WordPress in the Autoinstaller section. Fill in the information on the next screen. 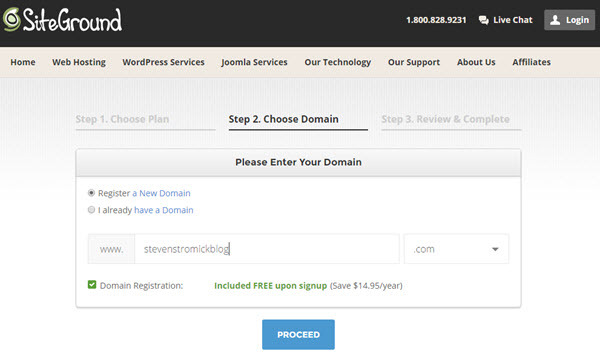 Choose Domain – choose your domain name you want to install WordPress on from the choices in the drop-down menu . 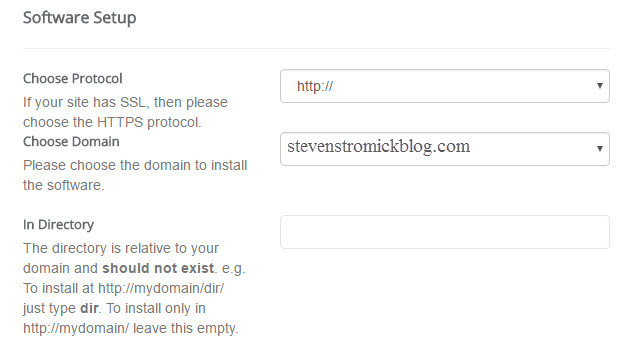 Site Name – This is the name of your blog. You can change this later. Site Description – This is the tag line for your blog. Again, you can change this later. 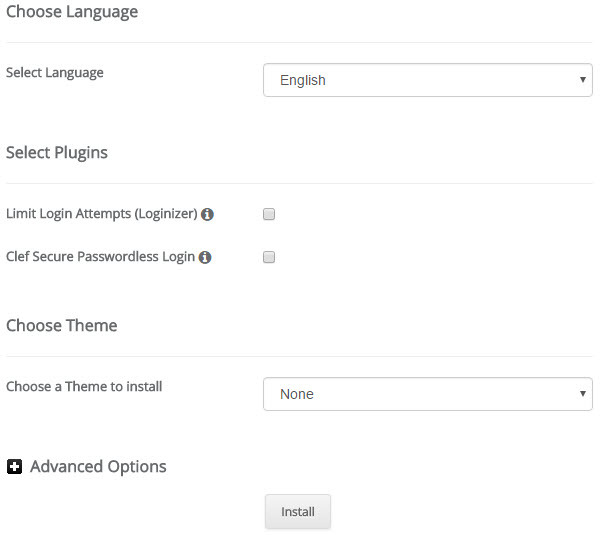 Admin Password – This is the password to access your WordPress backend (your blog’s dashboard). Choose a strong password to prevent hackers from easily accessing your site. Choose Theme – Wait until later to install your blog’s theme. In a future post, I will show you where you can find the best themes and how to easily install them! Click Install and there you go! You have setup you blog and it is now on the internet. Now, you can log in with your username (or email) and password. A theme is going to control the overall look and appearance of your blog. One of the beauties of WordPress is that you can change your theme (the entire look of your blog) with just a few clicks. Now when it comes to themes there are free themes and paid themes. If you are looking for free, there are hundreds and hundreds of free themes in the WordPress theme repository. There aren’t flexible when it comes to changing anything about the layout, fonts or colors. Paid themes will typically cost you between $50-$100 but offer you much more flexibility, support and security. They also typically look much more professional. If you do a search, you will find that there are thousands of paid themes out there and you will soon start to question which one is right for you? Visual Appeal – This is probably what you will focus on first. Try to find a theme that has that essential layout and feel you are looking for. Flexibility – How much do you want to be able to change the layout of some things or the fonts and/or colors. Some themes give you more customization options than others. Often the layout is the most difficult thing to change and if you are looking to tinker with the layout then you are going to want a theme that is more of a “framework” and has movable elements. Responsiveness – You definitely want a theme that is “responsive” and resizes properly for different devices. Support – Do the theme makers offer support? Do they have an existing knowledge base of frequently asked questions? Skill level required – Do you need to be a CSS expert to make changes to the site or do they offer point and click, drag and drop customization? It is no easy feat to find a good theme that fits your needs, so I have compiled a list of some of the best paid themes out there. Here are some of the themes that I liked, use and recommend the most. They have developed a parent Genesis framework upon which all child themes are designed. Visit studiopress.com and you will find dozens of great looking child themes that you can purchase. While the themes look amazing, you will need to know a little CSS to make any modifications (or pay an additional fee for the Genesis Design Palette Pro plugin which makes it easy to change fonts, colors, spacing, etc.). Genesis has been around for a while now and has an awesome community support forum (over 101K sites to date) and tons of loyal users. Check out the different StudioPress Themes. Elegant Themes has dozens of premium WordPress themes to choose from. They offer blogger themes as well as business and magazine style themes. They also offer the Divi theme which is a drag and drop framework that allows you to create your own design even if you don’t know HTML or CSS. The Divi theme is amazing and you can create almost any type of design with it. Check out the different themes from Elegant Themes. Theme Forest is a marketplace where individual themes designers can sell their own theme designs. The only drawback is that since this is a marketplace, any support will come from the individual who created the theme. So be sure to do your research and check the rating and reviews before you buy. Once you have found a theme you like, here is how you can install it on your blog. 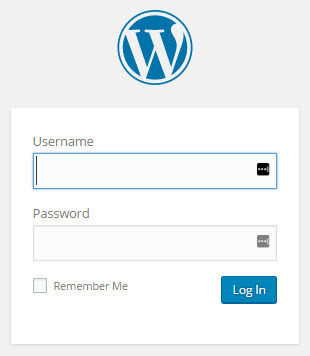 First, log into your WordPress backend. You can do this by going to http://yourdomainname/wp-admin. So if your domain name is freshcakes.com, you would go to http://freshcakes.com/wp-admin. 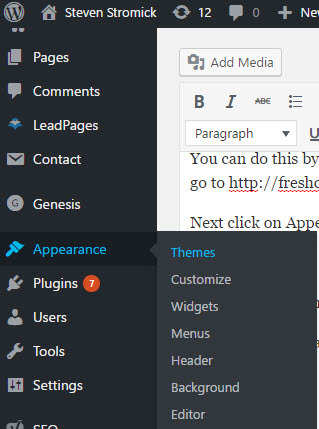 Next click on Appearance then Themes. This will bring you to a page that shows the current themes you have installed (and which one is active) on your blog. Next, click the Add New button. 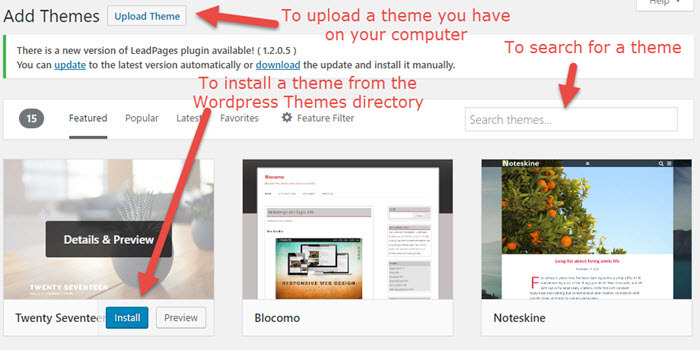 From here you can either upload a theme or search the WordPress theme repository to find a theme to install. To search for a theme, simply type a search phrase in the search box (or click on the Featured, Popular, Latest, or Favorites links). From the results, you can hover over the theme and click the Install button to install the theme. If you have purchased a theme (or previously downloaded it) then you can click the Upload Theme button and then click the Choose File button to locate the theme .zip file you wish to upload. Finish by clicking the Install Now button to complete the upload and installation. 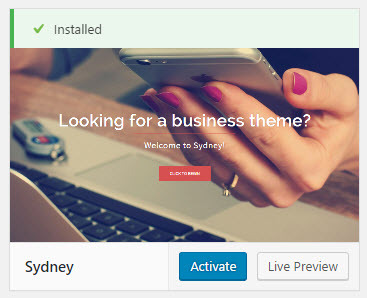 Once the theme is installed, you will need to click the Activate button to make it the active theme for your site. You can do this now or at a later time. There is also a Live Preview button if you want a sample of what your blog will look like under the new theme. Congrats, you have setup your new blog! I know you still have plenty of questions as to what to do next. I’ve got you covered, This is just the first in a series of posts to get you going with WordPress and your blog. Would you do me a favor? If this has helped you, I would really appreciate it if you shared it. Not only will you be helping others who need to learn how to start a blog but you will also be supporting my blog and that is how we all grow our blogs…. one share at a time. OMG where was this post when I first started my blog?!?! I would have loved this guide because you seriously break it down to its most simplistic form. Great job sharing all this info for people who need it!